The government and treasury of the British Indian Ocean Territory have issued (21st November) the fifth and final coin that is part of the series highlighting “Mythical Creatures,” featuring some of the world’s most well-known stories and legends which originate from the myths of ancient Greece and the Rome. The stories not only focus on the extraordinary, they also teach that vices such as jealousy, greed, and treachery have consequences. 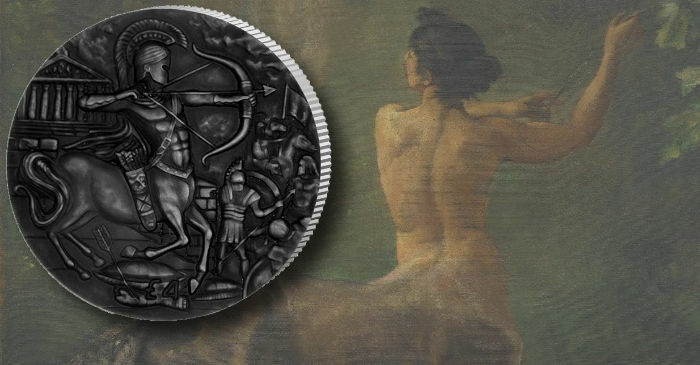 The fifth coin features the centaurs, who are half-human, half-horse creatures from Greek mythology with the torso, head, and arms of a man, and the body of a horse. They were thought to be the offspring of Ixion, king of the Lapiths, and Nephele, from the creation of a cloud made in the image of Hera. However, as with all Greek myths, there are different theories. Although most centaurs were depicted as lustful and wild, one of the most famous centaurs was Chiron, who was a wise centaur known for his medicinal skills and teaching abilities. Aside from his teaching abilities, he was the son of the titan god Cronus and the nymph Philyra, and, although most centaurs had the upper body of a man and the lower body of a horse, Chiron’s front legs were also human. Other differences between Chiron and his brethren were that he was far more civilised in nature, not indulging in drinking and being overcome with lust. He had superior knowledge, and he had a different lineage to the other centaurs who were created by the union of Ixion and Nephele. The wise and revered Chiron lived on Mount Pelion with his consort, the nymph Chariclo, with whom he had three daughters: Hippe, Endeis, and Ocyrhoe — and a son — Carystus. His students were said to have included famous heroes and gods of the Greek myths such as Asclepius, Ajax, Achilles, Theseus, Jason, Peleus, Perseus — and even Heracles and Phoenix. His death came about during events that started when Heracles visited the centaur Pholus in his cave while trying to complete the fourth task described in The Twelve Labours of Heracles. The two individuals had supper and Heracles asked for wine. Pholus opened a bottle of sacred wine given to him by Dionysus, but the smell attracted the other centaurs from the nearby area. In an effort to take the wine, the centaurs attacked the two unsuspecting diners but Heracles was able to kill many of them using poison arrows, hitting Chiron by mistake with one of those arrows. Despite Chiron being immortal, and, in theory, could not die, the poison caused unbearable pain to him. To stop the pain, he gave up his immortality in exchange for Prometheus’ freedom, when he was asked to do so by Heracles. Chiron then took a space on Mount Olympus along with the gods, and, as a reward, was placed among the stars as the constellation Centaurus. The coins are produced by the Pobjoy Mint at their facilities in Surrey, England, on behalf of the treasury of the British Indian Ocean Territory. 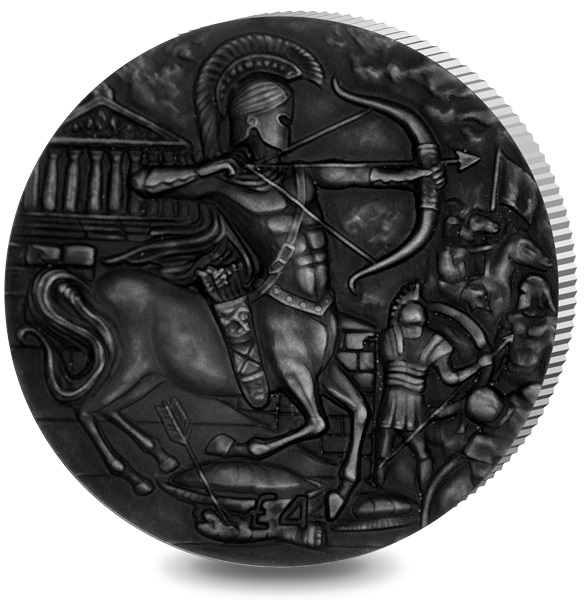 The reverse design on the coin features an image of a centaur taking part in a battle. The design also shows Greek soldiers and a building in the background. 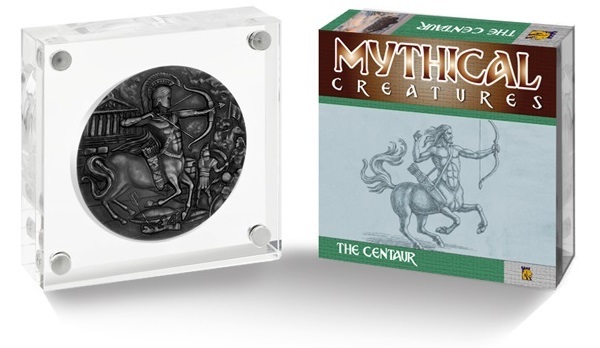 The high relief and Antique finish effects on the coin bring this mythical character to life, emphasising the powerful nature of the centaur’s unusual body. The obverse of each coin features an effigy of Her Majesty Queen Elizabeth II, which is an exclusive design from the Pobjoy Mint. 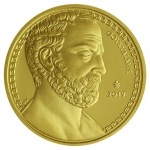 The legend includes the coin’s issuing authority and year 2018. Each two-ounce fine silver coin has been produced in high relief with each coin being finished with an oxidised process, which creates the Antique look and brings out the detailed and high relief striking. Each coin is encased in a creative Perspex container in the shape of a square that frames the coin and allows for easy display. The frame is packaged in an outer printed sleeve and includes the certificate of authenticity. 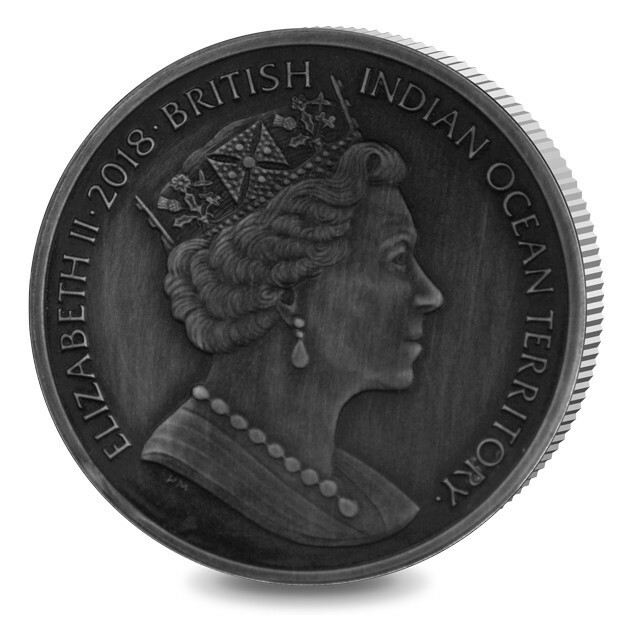 For additional information about this coin and others issued by the treasury of the British Indian Ocean Territory, please visit the online website of the Pobjoy Mint.